Fee-Only Financial Advisors Never Earn Commission or Sell Investment Products. Every financial planner, financial advisor and investment manager on FeeOnlyNetwork.com has been vetted to meet the high standards of the The National Association of Personal Financial Advisors (NAPFA) for strict fee-only compensation and ethical obligation. Compensated only by the client without earning commission of any kind for product sales or referrals. Legally sworn and obligated to always place the interest of the client ahead of their own. Not affiliated with any brokerage firm, bank, or insurance company. You need a trusted financial advisor, not a sales professional. Financial professionals from brokerage firms, banks, or insurance companies may focus on selling investment products like specific mutual funds, annuities, and insurance products instead of offering comprehensive financial planning to guide you toward your short and long-term goals. 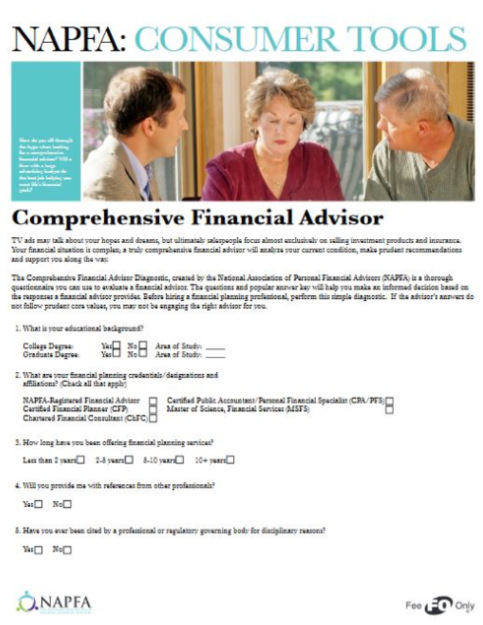 The Comprehensive Financial Advisor Diagnostic, created by the NAPFA is a thorough questionaire you can use to evaluate a financial advisor. The questions and popular answer key will help you make an informed decision based on the responses a financial advisor provides. If the advisors answers do not follow prudent core values, you may not be engaging the right advisor for you. Search advisors that offer a variety of specialties and service models – financial planning, asset management, project based, and other arrangements. No registration required and free to use. Contact only advisors that may be a fit for you. Advisors pay an annual fee (and are routinely vetted) to have a comprehensive profile page and listing on FeeOnlyNetwork.com.